1981 - Raford Cade and his family start Moulding Associates, Inc. out of a home office, using a storage garage for warehousing. The business model is slab only sales. 1986 - The Cade family moves the business into office and warehousing space in Garland, TX. The initial product offering is primarily decorative shaped glass doors and a few panel options. 1990 - MAI continues to grow and adds several panels to the product offering. During this time, stair parts are added to the product offering. 1999 - MAI builds a new manufacturing and office facility in Wylie, TX. The expansion allows them to begin pre-hanging doors. 2003 - MAI adds warehousing space and a pre-finishing facility to it's operations. The expansion brings their facility to 90,000 sq. 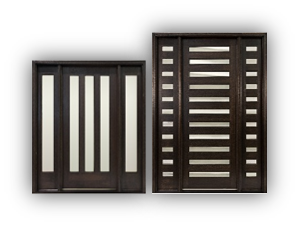 ft.
2003 - MAI begins offering the beautiful Andean walnut doors with natural wood characteristics. The Home Towne Collection is also added to the offering. 2007 - MAI invests in the business in the form of high-tech equipment and a re-engineered pre-finishing formula for enhanced performance. 2012 - The elegant diamond bevel glass is launched in Andean walnut doors. 2013 - MAI expands it's TDL offering with additional lite patterns and doors widths. 2014 - MAI launches the Contemporary Collection, which offers a modern look couples with MAI's tradition of quality. 2015 - The MAI Select Series is introduced. It's a special platform that enables MAI to offer unique designs based on customer requests. 2016 - The Contemporary Collection is expanded with the addition of the Slim Lite and Vertical Lite designs. Popular darker stains, Charcoal and Graphite, are added to the pre-finish stain options. The Westport Collection, MAI's signature Mahogany craftsman door line, gets revamped. This brings a number of grille options to our craftsman product. 2017 - MAI introduces the Mid Century Modern door line, a Knotty Alder value door line, a Shaker Style craftsman door line, and a unique, customizable interior Barn Door line.